The Wilkes-Barre Scranton Penguins season long eight game winning streak came to a screeching halt last Friday, against the Providence Bruins. The Pens were shut out 1-0 despite third string goalie Anthony Peters making 43 saves. Zane McIntyre, a 25 year old goalie in his third AHL season, made 28 saves in the win. This guy is going to be a huge problem this postseason. It is worth knowing that Daniel Sprong did not play in this game, and J.S. Dea was called up to Pittsburgh to join the NHL Pens on the California trip. If WBS was playing against any other goalie, these absences would be enough to explain the shortage of Penguin scoring against the Bruins. However, there is more to McIntyre. The Pens last played Providence on November 11th and beat the Bruins and McIntyre 4-3 in OT. McIntyre made 25 saves on 29 shots. Casey DeSmith was in net for the Pens. 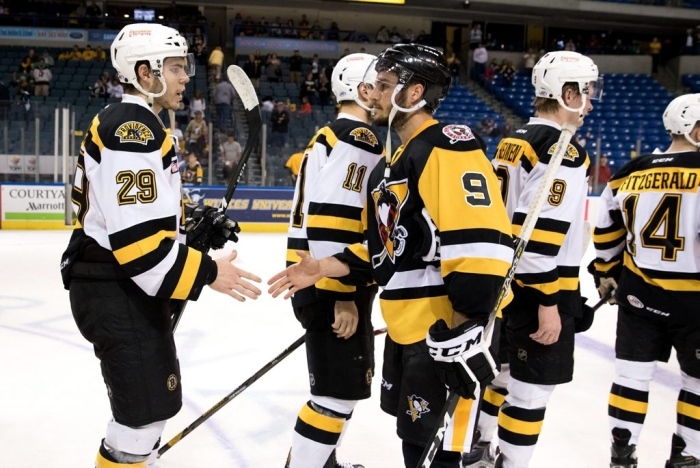 Last spring, the Providence Bruins defeated WBS in the first round of the Calder Cup playoff winning the series 3 games to 2. Providence won the first game 2-1 and McIntyre made 30 saves on 31 shots. WBS won game two, 6-5 in OT, and McIntyre had his arguably weakest game making 38 saves on 44 shots. WBS won game three 2-1, but McIntyre still had a strong performance and made 30 saves on 32 shots. The Bruins won game 4 by a score of 4-2 and McIntyre made 27 saves on 29 shots. McIntyre made 50 saves on 51 shots to eliminate the Pens in a signature 2-1 victory in game 5. Words can’t begin to describe what a frustrating game this was to watch, especially for it to be an elimination game. The sour taste in my mouth is still palpable. Counting last year’s playoff series and the previous 2 meetings against the Pens, McIntyre has made 228 saves on 244 shots good enough for a .934 save percentage. Based on the all time ranking of best save percentages EVER in the NHL, if McIntyre’s .934 save percentage were extrapolated to an entire season it would fall between 1967-1968 Johnny Bower and 1998-99 Dominik Hasek for 7th best save percentage in the NHL of all time. Granted McIntyre likely will not post these numbers for an entire season. 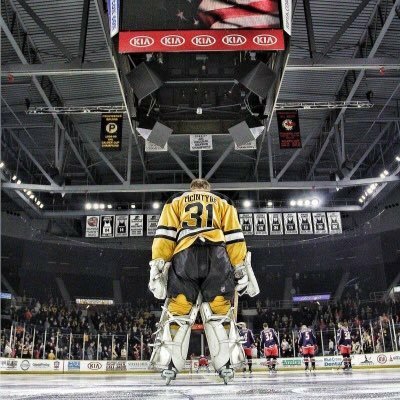 Yet, when McIntyre suits up for the Providence Bruins against WBS, it is the equivalent of essentially facing Hasek at the height of his power. WBS still has four meetings with the Bruins this season. There likely will be more meetings between these two divisional rivals scheduled this spring. I can’t say I’m looking forward to them at this point.